Dark chocolate chips sweetened with maple syrup? Now there's a special treat! Be forewarned, however, that these are dark... maybe like an 80% dark chocolate bar. If that is too dark for your taste you can experiment with a bit more maple syrup. These chocolate morsels are perfect in cookie bars, banana ice cream, chocolate chip ice cream, peanut butter date paste and so much more (links below)! Line a baking sheet with parchment paper, wax paper, or a silpat. 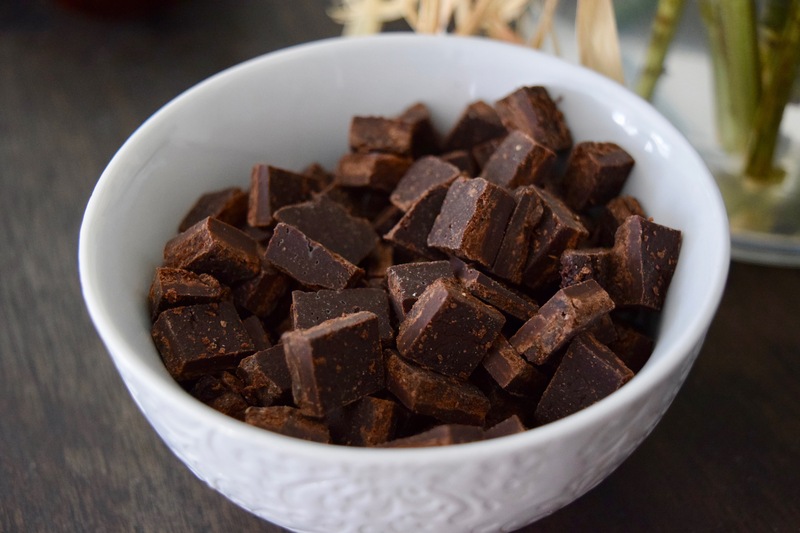 Chop baking chocolate into smaller pieces, making it easier to melt. Place the chocolate chunks and maple syrup into a small pot. Heat the pot over medium-low heat. Stir the ingredients often until everything has melted and mixed together. Pour the chocolate onto the parchment paper and spread into a thin even layer. Put the baking sheet in the freezer for about 30 minutes until the chocolate has formed a stiff chocolate sheet. Remove the chocolate sheet from the parchment paper and place onto a cutting board. Using a sharp knife slice chocolate sheet into tiny chocolate chunks. Keep chocolate chunks in an air-tight container or ziplock and store in the freezer until ready to use.